www.sf.edu, founded in 1890 in Lafayette, Indiana. Moved to Fort Wayne in 1944. Founder of Sisters of Saint Francis of Perpetual Adoration religious order has had lasting impact in the Fort Wayne area Bishop Kevin C. Rhoades, sisters from University of Saint Francis plan to attend Mass in Germany elevating her to one step from sainthood. by Kevin Kilbane was published November 7, 2013 on The News-Sentinel newspaper. Order’s founder to be beatified by Rosa Salter Rodriguez published November 7, 2013 on The Journal Gazette newspaper. Saint Francis at 125 a The News-Sentinel newspaper Digital Special. 1869 St. Joseph Hospital opened in the former Rockhill House hotel, which was constructed about 1838. It was operated by the Poor Handmaids of Jesus Christ order of religious women. See rest of timeline in St. Joseph Hospital has a long history of care a staff report with photos published September 21, 2017 and New downtown Fort Wayne hospital won't bring job cuts by Bob Caylor published September 21, 2017 on The News-Sentinel newspaper. A 1910 photo was posted September 21, 2017by Downtown Fort Wayne on Twitter. A January 5, 1928 photo of patient in hospital bed using book mobile was posted July 6, 2017 by Allen County Public Library on Facebook. With news September 20, 2017 that a new hospital will be built downtown, over 30 photos were posted September 21, 2017 on You are positively from Fort Wayne, if you remember... Closed group on Facebook. St. Joseph Hospital - three Poor Handmaids of Jesus Christ came to Fort Wayne Sisters Maria Henrica, Rosa and M. Matrona to organize the hospital opening May 4, 1869. See history on St. Joseph Medical Center IndianaHistory.org , St. Joseph Medical Center & the Poor Handmaidens of Jesus Christ by Tom Castaldi published March 13, 2014 on the History Center Notes & Queries blog, and timeline on Lutheran Health Network St. Joseph Hospital History. Hearing the Call: The Art of Nursing at St. Joseph School of Nursing by Erika Baker published April 1, 2013 on the History Center Notes & Queries blog discusses the early history of the nurses and origin of the hospital. Was at 2000 Wells Street, between 1886 and the late 1970s. 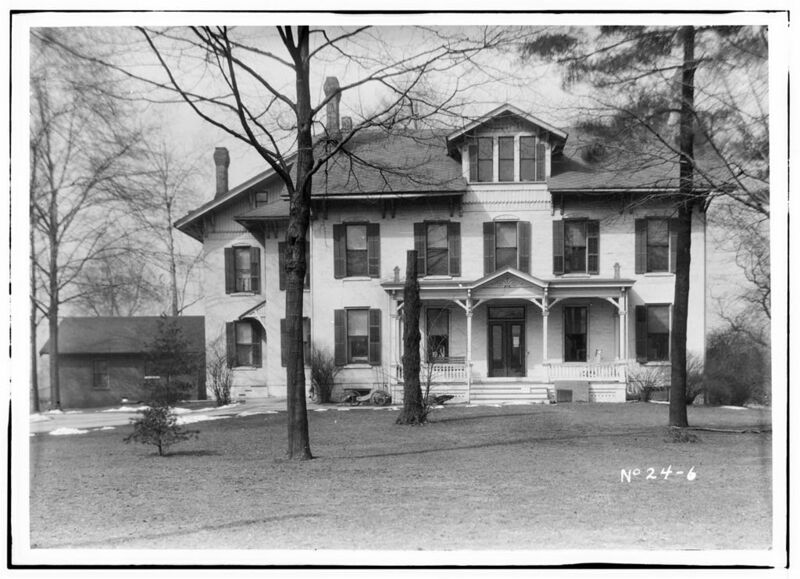 St. Vincent Villa Sources Online posted by ACPL Genealogy Center February 09, 2015 on their blog. Has a Facebook page. "The Saint Vincent Villa Catholic Orphanage closed more than 30 years ago, so unless you’re middle-aged, you probably know little or nothing about the place. For decades it housed children from families that couldn’t afford to raise them; from families that abused them; or from families destroyed by crime. As many as 300 children were there at any given time. Every year, the people who were raised there get together for a reunion." Frank Gray wrote in Orphanage reunion finding the lost in the Journal Gazette newspaper published April 17, 2012. See History, searchable Scrapbook of photos, odds and ends, and 1941-1954 Newsletters at St. Vincent Villa, Fort Wayne, Indiana on The Genealogy Center web site. Byron Health Center move to old YWCA campus could boost sale of county land by Kevin Leininger published February 8, 2017 in The News-Sentinel newspaper. See old photo and long discussion February 14, 2015 on You are positively from Fort Wayne, if you remember... Closed group on Facebook. A 1918 Sanborn Map showing the downtown Allen County Public Library was posted September 5, 2017 on You are positively from Fort Wayne, if you remember... Closed group on Facebook. More information about Sanborn maps can be found on our Maps of Allen County, Indiana page. At least 100 years at Harrison and Second Streets since 1916. Discussed May 30, 2016 with 1916 advertisement and photos on the original Great Memories and History of Fort Wayne, Indiana page on Facebook. 1924 was at Clinton and Columbia Avenue, is currently Freimann Square. Was also in Georgetown Square from June 25, 2016 discussion with downtown photos on Indiana News 1 formerly You know you've lived in Fort Wayne too long when... Facebook group. 926-930 S. Calhoun Street, on the northwest corner of Washington and Calhoun Streets, was erected by Henrietta Schmitz as a monument to her deceased husband Dr. Charles Schmitz. This is one of Fort Wayne’s most widely-recognized historic buildings. The Schmitz Block was added to the National Historic Register, see the application, same application with map, in 1988 and to the Local Historic Register in 1989. Architectural features include a facade of rough-cut limestone and round, rock-faced piers extending the entire height of the building. The windows of each floor are given various design treatments, and the cornice has modillions carved with grotesques, chimeras, lion’s heads and leaves. The first floor once had three storefronts along the Calhoun Street side. In 1912, the property was sold by the Schmitz children to William H. Noll, a prominent local businessman. Eventually was renamed the Noll Block. The Schmitz Block housed various offices and businesses over the years. In 1989, extensive rehabilitation began to turn the Schmitz Block into condominiums and office space known as Midtowne Crossing. The work revealed the stone block inscribed with “Schmitz Block.” See Schmitz Block history with photos and timeline on midtowncrossing.netand is one of the many Historic Buildings and Structures of the West Central Neighborhood Association Fort Wayne, Indiana on WestCentralNeighborhood.org. Built at the turn of the last century by a Dr. Schultz and now listed on the register of historic homes. It’s now home to Potter’s Wife Gallery by Dan and Christine Hudson. In the basement sisters Christine Hudson and Kate Fowler cut and sew and stuff new life into old furniture. This portion of the Schultz House is Delaney’s Upholstery. Enjoy Hands-On Fun at Science Central! on Visit Fort Wayne blog. Location of the INC Skyview camera of Downtown Fort Wayne. See photos of 1930s City Light power plant with train tracks for coal cars posted May 3, 2017 on the original Great Memories and History of Fort Wayne, Indiana page on Facebook. In 1924, construction began on the Mizpah Shrine Temple, promising to provide Northeast Indiana with a much-needed community meeting place to host speakers and theatrical productions as well as banquet facilities. The auditorium sat over 2,400 patrons, while the Banquet Hall could seat over 2,000. The auditorium was to be given to the public for use, with the Shriners requiring it for only four or five days a year. Copied from Historical Analysis of the Scottish Rite Center - University of Saint Francis buys Scottish Rite Center November 10, 2011 Statement issued Thursday by the University of Saint Francis and Saint Francis unveils plan for Scottish Rite November 11, 2011 by Dominic Adams. January 18, 2012 Scottish Rite History in Fort Wayne from History Center Notes & Queries blog. January 26, 2012 the University of St. Francis takes over Scottish Rite renaming it the USF Performing Arts Center. See 2 postcards and discussion August 13, 2017 on You are positively from Fort Wayne, if you remember... Closed group on Facebook. Consecration and dedication of the Scottish Rite Cathedral, Valley of Fort Wayne, Indiana, Tuesday, Wednesday, Thursday, November 16, 17, 18, 1909 Publication date 1909. Started in 1986 at Zollner Stadium, then IPFW, and Concordia College, moved to Columbia City, but ended in 2012 according to Keeping Scottish heritage alive by Rosa Salter Rodriguez published December 1, 2015 in The Journal Gazette newspaper. Brochure photo discussed August 1, 2017 on You are positively from Fort Wayne, if you remember... Closed group on Facebook. Sears Archive online: www.searsarchives.com. Store advertisement from 113-115 West Berry Street before the mega store opened on South Clinton Street was discussed September 2, 2017 , update with current and past photos on location remodeling to Aptera Web Design April 16, 2018 and general Sears Search on You are positively from Fort Wayne, if you remember... Closed group on Facebook. Discussion of photos at Clinton and Rudusill store posted October 20, 2017 on You are positively from Fort Wayne, if you remember... Closed group on Facebook. Sears at Glenbrook Square among the latest 46 targeted for closure in November published August 23, 2018 in The News-Sentinel newspaper. Special Report: Cheers to Sears! video with Dave Stalter who worked at the store for forty years by Tom Powell published October 30, 2018 on WKJG Fort Wayne's NBC TV station. Photo above is from an article that stated In 1906, the mega-company published a specialized 'Tombstones and Monuments' mailer, advertising it as a 'Catalogue of Memorial Art in Granite and Marble.' Sears’ prices, which beat out traditional funeral parlors’ significantly, allowed consumers to participate in the elite practice of custom-ordering grave markers. 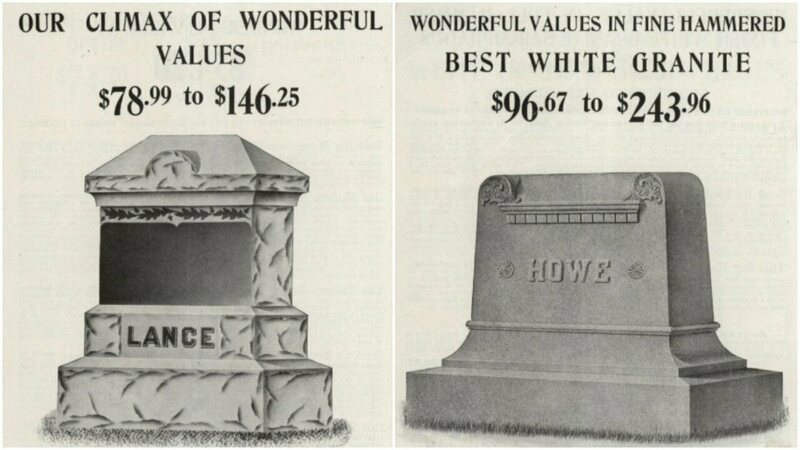 Copied from Sears Once Offered Mail-Order Tombstones Its beloved catalogue had a good run. by Evan Nicole Brown published October 30, 2018 on AtlasObscura.com. See the 1906 Sears Tombstone catalog on our cemetery page. From 1908 to 1940, the Sears Modern Homes Program offered complete mail-order houses to the would-be homeowner — what would come to be called “kit homes.” Customers could select from dozens of different models in Sears Modern Homes Catalog, order blue-prints, send in a check, and a few weeks later everything they needed would arrive in a train car, its door secured with a small red wax seal (just like the seal on the back of a letter). Paragraph copied from The House that Came in the Mail on 99% Invisible.com half-hour audio that includes a transcript of the audio with lots of images of houses and catalog pages. They described Production as Producer Joe Rosenberg spoke with Rosemary Thornton, an architectural historian and the author of The Houses That Sears Built: Everything You Ever Wanted to Know About Sears Catalog Homes; and Penniman: Virginia’s Own Ghost City; Guy Parks, who lives in a Sears catalog home in Cairo, Illinois; and Rebecca Hunter, a Sears house hunter who lives in Elgin, Illinois and wrote Mail-Order Homes: Sears Homes and Other Kit Houses. This item was posted September 15, 2018 by ARCH ( Architecture and Community Heritage), who has local Sears homes addresses in their files, on You are positively from Fort Wayne, if you remember... Closed group on Facebook. A Comment by Olinda Frances Wilson stated There is one at the corner of Cook and Felger roads in Lake Township. It arrived in Arcola on the train. to a September 15, 2018 Post by ACGSI on Facebook. Sears craftsman homes 2309 N. Anthony posted September 28, 2017 on Live in the '05on Facebook. Others may be on Broadway, Creighton, Fairfield, and Rudisill areas from a November 19, 2012 comment on The Amazing Collection of Sears Homes - in the Midwest! on SearsHomes.org. 11104 W. Cook Road built by Felix F. Ladig in 1914 or 1915 with his wife Frances and their four children, left the original Sears shipping label, is shown in several photos from horse and buggy to automobile on The Proud Owners of a Sears Modern Home No. 118 posted October 22, 2013 on Sears Homes of Chicagoland Sears-Homes.com. Video posted November 13, 2017 on NBC Nightly News with Lester Holt. Long discussion with some locations mentioned and images in the Comments January 25, 2018 on You are positively from Fort Wayne, if you remember... Closed group on Facebook. Home Shopping with video shows several local Sears homes by Eric Olson, 21Country Featured Reporter published July 9, 2018 on WPTA21 ABC TV station. Sometimes confused with Lustron Homes. 2208 Wayne Trace. Mr. Sieling owned a dry goods store that was located adjacent to the house to the east, and the park across the street is named for him. Sieling donated the park land, once a part of the Wayne Trace Indian Route to Cincinnati, in 1915. Copied from a 1997 photo posted August 7, 2018 by ARCH ( Architecture and Community Heritage) on Facebook showing this once on ARCH's Endangered List due to it having an uncertain future, it's now The Rose Home, a transitional living facility for women. Settlers, Inc. "Since 1971, costumed Settler members have researched the early Americana domestic arts and crafts, their politics, history, folklore and mechanics involving the many skills needing to survive early America. Settlers have shared their knowledge with the community via their Speakers' Bureau and their programs at the Swinney Homestead." Seyferts Company History on TroyerFarms.com states: In 1933, Charles Seyfert left his home in PA and drove his pretzel truck to Chicago for the World's Fair. On his way back home, he passed through Fort Wayne, Indiana, liked what he saw of the northeastern Indiana town and stopped there to begin a pretzel-making business. Although pretzels were Seyfert's dream, Fort Wayne wasn't ready for pretzels at that time and the businessman went broke. After a trip back home to PA to gather equipment, Seyfert returned to Fort Wayne and started a potato chip operation. This time, the snack food entrepreneur was successful. Seyfert opened its doors August 20, 1934, the operation was much different than today's. Charles Seyfert did everything himself – from peeling potatoes to making chips to delivering the finished product. Today, miles and miles of conveyor belts carry the raw ingredients, cooked snacks and bags of goodies from one area of the plant to another. In 1982, Borden Inc. acquired Seyfert. In October, 1994, Heath acquisition Corporation acquired the Seyfert Foods division from Borden Inc.. In 2001, Troyer Potato Products acquired Seyfert Foods. The Troyer organization acquired Seyfert Foods in March 2001 but the relationship between the two companies goes back to the 1960s. At that time, Troyer supplied Seyfert's with potatoes. At the time of the acquisition, Troyer sold its products in Pennsylvania, eastern and central Ohio, western New York, and parts of West Virginia and Indiana. A photo of the potato chip plant that closed June 17, 2010 was posted in THIS DAY IN HISTORY: June 17 in photos by Dan Vance published June 17, 2018 in The News-Sentinel newspaper. Great Memories and History of Fort Wayne photo. Discussed January 8, 2017, February 12, 2017 , photo of large can posted March 17, 2017, more discussions May 28, 2017, September 3, 2017, several photos posted October 22, 2017 and more can be found in a Seyfert Search on You are positively from Fort Wayne, if you remember... Closed group on Facebook. Employees notified snack-maker Seyfert's is shutting down by Jonathan Shelley, News Directo and Corinne Rose, Reporter published August 20, 2018 on WPTA21 ABC TV station. Photo of a Seyferts potato chip was posted August 20, 2018 by Indiana Historical Bureau on Facebook. See comments posted August 20, 2018 by WKJG Fort Wayne's NBC TV stationon Facebook. 719 Union Street, Architect A.M. Strauss designed this Tudor Revival apartment complex in 1925. Opening in 1926 as the first ever large apartment building in Fort Wayne, from Sheridan Court Apartments on West Central Properties. Across Berry Street from the Courthouse, later became the Gettel Building. Photos and discussion September 24, 2017 on You are positively from Fort Wayne, if you remember... Closed group on Facebook. Website: www.smdairport.com and Facebook page. The airport was dedicated and began operations in June 1925. Was the City of Fort Wayne’s first municipal airport and was originally called Baer Field in honor of Paul Baer. Situated on 236 acres of land approximately 5 miles north of downtown Fort Wayne and less than two miles from Interstate 69. The first airmail flight left Fort Wayne on December 8, 1930. Airmail service continued until 1933 when it was dropped until 1937. In the early 1940's, Smith Field had scheduled airline service from TWA. Read more on Smith Field Airport at Airport History on AIRPORT AUTHORITY FORT WAYNE INTERNATIONAL website. On the National Park Services: A National Register of Historic Places Travel Iternary - "a rare surviving example of an early 20th-century airport, is historically significant for its association with air-related transportation and commerce in Fort Wayne and Allen County, Indiana. In 1919, the city of Fort Wayne inspected the site that eventually became Smith Field for its suitability as a municipal airport." Slated for closure in 2003 but pardoned through the influence of pilots, nearby residents and historians, the future of Smith Field -- Fort Wayne’s “other” airport -- is not only secure, but bright. Once down and nearly out, the sky's the limit for Fort Wayne's first airport by Kevin Leininger had more to read and was published December 30, 2015 in The News-Sentinel newspaper. Wells Street Smoky Montgomery was well known around the area. Discussed March 4, 2017 and July 10, 2017 August 5, 2017 on You are positively from Fort Wayne, if you remember... Closed group on Facebook. See Charles Lee "Smoky" Montgomery September 20, 2006 obituary on Find A Grave. Was built in 1972 by Michael Graves for Sanford and Joy Snyderman. Click pink house on right of link to see photos of unique archetecture of Snyderman House (1972-1977) architect Michael Graves on WTTW PBS. Snyderman's left the house in 1998 and sold it in December 1999 to developers Joseph Sullivan and William Swift who planned to tear it down and develop homes on the property. Their daughter Nancy Snyderman is a medical doctor and national television personality. Snyderman Houseon Wikipedia, the free encyclopedia, The Snyderman House discussion published August 15, 2011 on nancynall.com 2002, IUPUI.edu photo, August 7, 2002 story with photo on Architectural Record.com. Ian Stallings Design photos on Facebook. Photos and discussion March 29, 2017 on You are positively from Fort Wayne, if you remember... Closed group on Facebook. Photo of a car in 1947 posted May 1, 2017 on the original Great Memories and History of Fort Wayne, Indiana page on Facebook. Discussion and several videos posted in Comments October 22, 2017 and general Speedway search on You are positively from Fort Wayne, if you remember... Closed group on Facebook. South Anthony Speedway Memorabilia has copies of programs. Several photos posted November 19, 2018 on Great Memories and History of Fort Wayne (Public Group). On Warsaw Street is over 87 years old. Torn down and replaced with a Walmart. The March 16, 1967 groundbreaking photo in The News-Sentinel newspaper was posted June 30, 2018 showing Al Zacher developer, mentioned Wolf & Dessauer and Montgomery Ward among other stores would be there, then over 60 photos, lengthy discusison January 3, 2017 , more photos and discussion February 13, 2017and again February 13, 2017-2 on You are positively from Fort Wayne, if you remember... Closed group on Facebook. Southtown Mall with photos remembered on Labelscar - The Retail History blog. YouTube video Circa 1992. A 6 and a 1/2 min walk through the now demolished Southtown Mall in Fort Wayne, IN. The video goes from L. S. Ayres to Sears, the Kohls wing is not included. Photos and more on Some History About Former Fort Wayne Speedway "A place called Fort Wayne Speedway operated on the north side of Fort Wayne just north of what is now Coliseum Boulevard and Glenbrook Square mall. It's now a place adjacent to a Putt Putt where little kids go to drive (very) small vehicles. The track was built in 1928 by Frank Funk, who also built other racetracks, including the former Jungle Park at Rockville and the Winchester Speedway, still operating. When the Fort Wayne Speedway was built in 1928, the area was farmland; it remained so for most of the track's existence. Coliseum Boulevard was California Road -- a dirt road then -- and neighboring farmers probably constituted what little traffic there was. From 1951 to 1964, another race track broke the silence on the south side of town. South Anthony Speedway ran two nights a week on a 3/8-mile asphalt oval. The homes in Victoria Park are in that spot now. Race tracks may come and go, but people's memories of them do not fade. The Fort Wayne Speedway especially is remembered for its track, which was said to be the highest-banked and fastest 5/8-mile track in the world." "On This Day"... forgotten Fort Wayne Speedway lives on by Don Radebaugh published October 2, 2015 on ARA Racing Series. Speedway name Search on You are positively from Fort Wayne, if you remember... Closed group on Facebook. Was at Robison Park, photo was posted April 20, 2017 on the original Great Memories and History of Fort Wayne, Indiana page on Facebook. See Indiana School for Feeble Minded Youth. Started in 1923 by Walker Steckbeck, the family owned it for 90 years when it was closed in December 2012. Longtime local paint company Ream Steckbeck closes Was founded in 1923 by Kevin Leininger was published December 20, 2012 in The News-Sentinel newspaper. Closed sign March 3, 2013 on the original Great Memories and History of Fort Wayne, Indiana page on Facebook. Opened in 1883 on Fairfield Avenue, was started by J. H. Stellhorn (Stellhorn Avenue is named for him) and there are still some hints to the store’s age, like the 1915 Master Rule scale. Fort Wayne's oldest hardware store is on the market by Bob Caylor was published January 19, 2016 in The News-Sentinel newspaper when the store closed and building was sold. Union Stockyards fire May 2, 1952, a few minutes of video is shown by Access Fort Wayne public television at the Allen County Public Library. Was discussed July 31, 2017 and Name Search on You are positively from Fort Wayne, if you remember... Closed group on Facebook including May 2, 1952 Union Stockyards Fire East Washington Blvd. Union Stockyards fire 1952 photo posted by WANE-TV NewsChannel 15. It was a total loss on the Fire Police City County Federal Credit Union online 2016-2017 calendar and the Hall's Stockyards Cafe 3005 Maumee Ave. Also discussed September 2, 2009 on Fort Wayne Railfan suggesting Sanborn maps show the locations of other stockyards. 712 S. Harrison St., since 1949, stoners.com. Stoner’s Funstores: Your Source for April Fool’s Pranks! by Lauren C. was published March 14, 2012 on Visit Fort Wayne blog. Stoner's from INFortWayne on Vimeo. In 1914 brothers Joe, Christian and Elmer Stucky purchased the Rich General Store and Hardware in Woodburn Indiana. One of the oldest family owned and operated appliance and electronic retailers in the United States. See their About Us page. Southwest corner of E. Wayne Street and South Clinton Street, opened as the Empress Theatre in the fall of 1912. By 1917 it was renamed the Strand Theatre. It was a moving picture theater as late as 1927. Today is part of the grassy open plaza fronting One Summit Square. Comments and Information from cinema Treasures. Joe Vogel said: design of the Empress Theatre was by one of the town’s leading architects of the period, John M. E. Riedel. He also designed the Lyric Theatre. In its early years, the Empress presented Sullivan & Considine vaudeville. Constructed in 1890 at 821 S. Calhoun Street, it. is one of downtown Fort Wayne’s oldest and most recognizable structures. It was one of the first locations in Fort Wayne to have early telegraph lines, the conduits for which can still be seen in the building’s basement. It hosted a Western Union and various financial institutions such as the first office for Lincoln Financial Group, a Fortune 250 company that still has a large office location and prominent community presence in Fort Wayne. Copied from The past and present of the historic Strauss Building by Jenn Kunkle published December 13, 2018 on Living Fort Wayne.com. Built in 1886-1887 for Christian G. Strunz, his wife, Lisette, and their daughter, Henrietta, is an outstanding example of Italianate and eclectic architecture designed by the renowned Fort Wayne architecture firm of Wing & Mahurin. It was individually listed in the National Register of Historic Places in 1979. In 1980 was moved by ARCH ( Architecture and Community Heritage) from 333 E. Berry Street (across from the McCulloch-Weatherhogg House/United Way building) to prevent its demolition for a parking lot for GTE. It now sits at 1017 W. Berry Street in the West Central Neighborhood alongside two other relocated homes to fill the large expanse of land once occupied by the Fleming house (torn down for a parking lot). Copied from a July 12, 2018 Facebook post with photo of the home being moved by ARCH ( Architecture and Community Heritage). See September 4, 1979 National Register of Historic Places Inventory - Nomination Form 79000030. The house was built in 1886-1887 for Christian G. Strunz, his wife, Lisette, and their daughter, Henrietta. Christian operated a grocery from about 1860 until his retirement in 1900. Henrietta's daughter Helen married Roy Sponhauer in 1922, and lived in the house with Henrietta until her death in 1945. Helen continued to live in the house until 1976, the year she died. That same year, GTE bought the house to use the lot for parking. Copied from the 2002 Home and Garden Tour by the West Central Neighborhood Association. There is a photo on the Christian G. Strunz House Facebook Landmark & Historical Place. Fort Wayne was considerably enlarged on August 14, 1894, when the City Council declared the annexation of South Wayne. This was a territory which extended south of Creighton Ave. between Hoagland Ave. and the St. Mary’s River. The wooded area had long been a favorite ground for the Miami Indians who remained in the precincts during early town days. The reservations of Richardville, LaFontaine and Beabien were all along the St. Mary’s just south of the South Wayne community. A stream through the area, known as Shawnee Run, disappeared with drainage work. A stone bridge over Shawnee Run had existed along Fairfield Ave., just north of Pontiac Street. The bridge work was still visible under the street, according the Peter Certia who went down the sewer in 1952 to have a look at it. The stream had meandered through what later became Beechwood Circle and environs east and west. Copied from a longer article called Oakdale History: South Wayne A History of South Wayne Community on Historic Oakdale Neighborhood Association. Discussed in South Wayne Area Once Was a Town Unto Itself by Dr. Michael Hawfield originally published February 21, 1994 and now online in Cityscapes - People & Places series of articles from the archives of The News-Sentinel newspaper. Fort Wayne was the highest point above sea level on the Wabash & Erie Canal, which ran from Lake Erie to the Ohio River. The canal was the longest in the Western Hemisphere, and it started in Fort Wayne on February 22, 1832, the anniversary of George Washington's birthday. 407 W. Washington Blvd, downtown camera shop. See January 10, 2017 discussion on You are positively from Fort Wayne, if you remember... Closed group on Facebook. Sunny Schick Camera Shop closing after about 90 years of business by Kevin Kilbane was published June 20, 2017 in The News-Sentinel newspaper. Closing in 2017 Shutter Down video published July 10, 2017 by Eric Olson, 21Country Featured Reporter. Downtown camera shop closing after more than 90 years by Kelly Roberts published June 20, 2017 on WANE-TV NewsChannel 15. See photos and discussion August 13, 2017 on You are positively from Fort Wayne, if you remember... Closed group on Facebook. 5501 U.S. Hwy 30 W., www.sweetwater.com, employs 800 with around 400 million dollars in sales. Started in 1979 in a VW microbus. Is the third largest United States dealer in musical equipment for musicians, recording studios, schools, houses of worship, concert sound companies and broadcasters. Sweetwater sells digital recording systems, keyboards, guitars, microphones, mixers, loudspeakers, signal processors, and drums. Sweetwater Sound, along with All Pro Sound, installed the new sound system in Indiana University's Assembly Hall in November. Assembly Hall is the home court for the IU Hoosier basketball team. From Sweetwater Sound installs sound system in Assembly Hall published January 27, 2013. Read more in Your Story. Made Here: Sweetwater by Melissa Long published November 19, 2014 on WPTA21 ABC TV station. Sweetwater: Sounds Like a Great Place! posted December 3, 2014 by Louisa on Fort Wayne Insider official blog of Visit Fort Wayne. Original construction of the house was begun in 1844 with a second story, wing, and rear portion added in 1885. Thomas Swinney gave to the city of Fort Wayne the eastern portions of his property. In 1847, the Allen County Fair was established on these grounds, with a half-mile racetrack as well as the usual display pens and corrals. The annual September Fair was held here for many years afterward. More than a decade later, in 1889, the first local Labor Day celebration was held on the Swinney grounds, and labor leaders long viewed the area as special for laboring people. ... Here at the Swinney property on July 4, 1843, hundreds of people of Fort Wayne and the surrounding region gathered to celebrate the grand opening of the Wabash and Erie Canal, the longest canal ever built in North America. Its ground-breaking had been held here in 1832, and in this presidential election year of 1843, candidate Lewis Cass appeared in town to make laudatory speeches along with other state and local notables. Copied from Swinney Home by Tom Castaldi, local historian, published April 3, 2014 on History Center Notes & Queries blog. Swinney Park & Jefferson Street, Fort Wayne, Allen County, IN at the Historic American Buildings Survey, Engineering Record, Landscapes Survey at The Library of Congress. With log cabin is now the home of Settlers, Inc at 1600 West Jefferson on the west side of Fort Wayne. www.sycamorehillsgolfclub.com - Jack Nicklaus designed golf course.